Vintage Science Fiction Month Rides Again! If you could ask your great grandparents what their life was like when they were growing up, you would, right? If you could go back in time and see what your country and your family were like before social media took over the universe, you’d be interesting in seeing what the world was like, right? This January, you can. This January, I invite you to travel through time with me. Travel into the past, look into the youthful eyes of your great grandparents. See what came before so we could have what we have now. Ok, maybe not time travel exactly. . . but sort of. Everything comes from somewhere. You came from your parents, duh. But who are the parents of your favorite science fiction books? I’ll tell you: the parents of your favorite science fiction books are the books that author read to be inspired and to dream. And those books have parents too. If you don’t like me using the word “book parents” here, how about “the author’s influences”? Something they were influenced and inspired by to create something new and modern. By reading older fiction, you get to see how that fiction progressed to get to where it is today. You get to experience the family tree, as it were, of speculative fiction. To learn more, click on “Vintage Sci-Fi Not-A-Challenge” tab up top. This is not a reading challenge. You do not have to do anything. You can read one book or ten. You can listen to a radio broadcast, you can watch and old movie or old TV shows. You can post a comment, a few sentences, a full on book review, a video blog post, you can just lurk if you want. There is one rule: what you read/listen to/view/ discuss should be older than me. If it was born before 1979 it’s fair game for Vintage Month. I’ll be posting again about Vintage Month in December, but in the meantime, help get the word out, because like every party the more the merrier. I’m taking a break from social media for a little while, so have fun talking about Vintage Month on twitter by using #VintageSciFi and #VintageSciFiMonth, and following @VintageSciFi_ (don’t forget the Underscore at the end! ), which is run by the amazing and enthusiastic Jacob at Red Star Reviews. If you’re on other social media feel free to chat about it there too. an you believe 2017 will be the 6th year of Vintage Month??? I can’t! It’s Red Alert for the Interstellar Patrol. Are you ready to take a trip back in time? 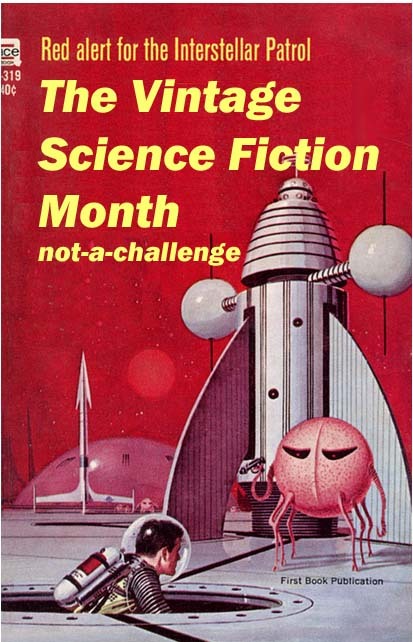 22 Responses to "Vintage Science Fiction Month Rides Again!" i grew up on the 80s version of that tv show. I’ve seen that book a year or so back at a used books store a year or so back. It was in good condition. Hooray! I’ll do my best to participate this year. I like the political and historical undertones to a genre that, on the surface, is apolitical, but only in a disingenuous way. Glad to see Vintage back for another year. I’ll have to start compiling a list of older SF books… yay! I’m glad this is a go again. I participated in 2015 and 2016, and will do so again in 2017. Last year, I set out to reread Dune but ended up reading a great deal of Simak. This coming year, I will try again for Dune. But may end up reading more Simak. We shall see. I’ll be joining up for, what, my third year? Fourth? Dunno. same here. Dunno how many years this has been happening for. I heard about this event from other bloggers. This is my first time participating in this and I am really excited. I love reading older science fiction! I’ll be back for another round!